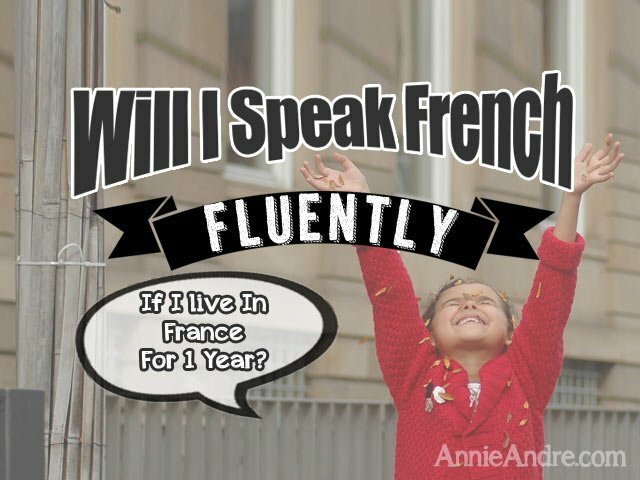 >> Will I (or my child) Speak French Fluently If I Live In France For 1 year? If I live in France for 1 year…………..
How much French will I learn? Will I be able to communicate easily in French with French people? Will my child be bilingual or fluent after a year in France? Can I speak French fluently by just living in France for a year? These are some of the many questions I receive from readers who wonder if they will be able to speak French fluently after living in France for one year. If you are wondering the same thing, then stick around. I’m going to share my family’s personal experience and some tips on how you can be more fluent. Allow me to set your expectation; It is possible to be fluent after living in France for a year but highly unlikely unless certain conditions are met. Even then there are no guarantees. Will I be a Novice? Intermediate? Advance? etc! Your level will depend on the effort and your conditions. I know not because I am a linguist but because I have first hand experience. I speak several languages myself at different levels and now I am raising bilingual children whose native tongue is English. Before we get into what conditions need to be met for you to be fluent, let’s first define exactly what fluent is. But first, what is Fluent? You can maintain a conversation, communicate with other people in everyday situations, interact and understand replies. You have the ability to express yourself easily and articulately. You have the ability to figure out the context of a new word by listening to a sentence. So exactly what conditions will help you become more fluent during your year in France? The level of French you speak before you arrive in France will greatly affect the level of fluency you achieve after one year. Even just a tiny weeny bit of French knowledge will give you a stronger foundation that you can build upon and ultimately attain fluency faster at the end of that first year. Take our family for example. Each member of our family spoke at different levels before arriving in France and it greatly effected the outcomes of our fluency. My husband Blake: –>Came to France with almost ZERO French ability and at the end of one year in France still spoke very little. More on that in a bit and why. My eldest son Kieran—> was 15 when he first arrived in France. He spoke close to Zero French and after a year he was able to carry on simple conversations but with some difficulty. He had a descent vocabulary but lacked the ability to have deep meaningful conversations or to explain complex ideas. Second son Andre—> He was 13 when we arrived in France and spoke a little more French than his older brother but not much more. After a year in France, we thought he might never progress in French. Not only did he have a very strong accent, he made very simple mistakes that Kieran was not making. It wasn’t until the end of his second year when his French took off like a rocket ship and he surpassed his brothers French abilities. More on this in a moment. 3rd child Catherine –>She was 4 years old when we arrived. From the day she was born, I spoke French to her while my husband and everyone else spoke English to her so she was already bilingual when we arrived in France. Her French definitely dominates her English but for someone who has never formerly learned English in a school setting, she speaks and reads English very well just through daily exposure at home. ME: –> I was already pretty close to Fluent when I arrived in France: I spoke French on and off as a child with my French Canadian father and family and went to a French high school in Montreal. Being in France that first year really solidified my French and helped build upon my already strong vocabulary. I learned more idomatic expression and felt very comfortable conversing in French at the end of my first year. Put yourself or your children in an environment where they NEED to speak French. In general, people learn a language best when they NEED to speak or because it is practical. How to create need based learning? A simple way to create need for yourself is to enrol in a French class while in France or volunteer like I do. Really anything where you interact in some way with other French people daily or at least several times a week. If you want your children to be as Fluent as possible than you need to put them in a situation where they also NEED to speak French. Only then will they truly begin the process of learning French. If they dont find it useful than they wont speak and they won’t progress. If for no other reason than to learn French, please enrol your children in French schools. This is by far the best, most painless, funnest and quickest way to expedite their French fluency. I enrolled my two sons; who spoke almost no French when we arrived. At the end of that first year, they both could speak passable French but they were no where near fluent. To make matters more confounding, Kieran spoke more fluently than Andre. How much time and effort you put into learning French will also have a huge effect. If you practice everyday versus weekly, you’re French will increase exponentially. Take for example my two sons. That first year in France, Kieran surpassed Andre’s French ability because he put more effort into studying French after school. We stayed a second year and Andre surpassed Kieran’s level like a rocket ship. But Andre did not study more so how did he do it? Easy, Andre made friends and talked to his friends everyday, during and after school non stop. Kieran continued studying but did not practice as much verbally. In my opinion, learning in a classroom is great but to make a difference you need to talk. And you need to talk a lot. What will happen if I don’t immerse myself or take French lessons? If you do not create a need or immerse yourself in French while in France then you will speak very little French after one full year in France. I know this for a fact. My husband is a good example of this. After one year in France, his French was not passable. Yes, he could understand a lot because he heard Catherine and I speaking at home but he could not respond in complete sentences. Part of the reason he didn’t progress past novice levels was because he had no need to learn. He had me. If there was a problem at the bank, I took care of it. If we needed to talk to the kids teachers, I would talk. He also did not take any French classes. It’s been three years now and he is inching his way forward by spending time and learning by talking with our many friends in France but it is clear that not having a good base is really stunting his progress. Blake if you are reading this, I love you but please sign up for a French class. Generally speaking, the current school of thought is that it is easier to learn a language the younger you are. Studies have even shown that learning at a younger age also improves your pronunciation in the foreign language. Now don’t get too excited; just because you are young does not guarantee a child will speak French magically. Kids still have to feel like they need to learn in order to learn and they need to be able to practice speaking it almost daily if they are ever going to reach fluency within one year. On the flip side, just because you are 30 or more does not mean you cannot become fluent in one year either. It just means you might have to work a lot harder to become fluent and you will most likely have a stronger accent than your younger counterpart. Lastly, motivation is a HUGE factor in learning a language. People who learn French because they are genuinely interested in communicating with others for travel, experiencing another culture or for personal reasons are much more willing to put forth the effort to actually learn the language. Whereas, those who learn French for a job or college credit or because their parents are forcing them to typically don’t do as well. Good luck to you = Bonne Chance!